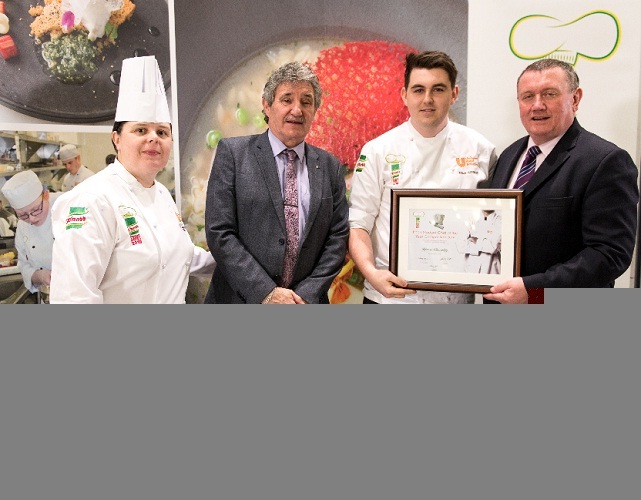 Kieran Cleverley, representing Southern Regional College, competed in the final of this year’s KNORR Student Chef of the Year 2019, at Waterford Institute of Technology. ‘Street on a Plate: a street food feast inspired by the food trucks, street stalls and farmers markets of Ireland,’ celebrates the evolving palette of the Irish population and its influence on the Irish food market. Students are marked for their creativity and interpretation of the theme as well as the presentation of each dish, food waste management and allergen awareness. Kieran created the menu with the intention of maximising flavour with a twist on presentation through using traditional street food style alongside a contemporary restaurant style to illustrate how the humble dish can be elevated. Speaking about the competition, Audrey Crone, Executive Chef Ireland at Unilever Food Solutions said, “This year marks my first KNORR Student Chef of the Year competition. “The talent demonstrated by each student chef is a real testament to the training centres and institutes of Ireland and made quite an impression on the judging panel. Each competitor displayed great chefmanship and creativity in the preparation and cooking of each of their plates.